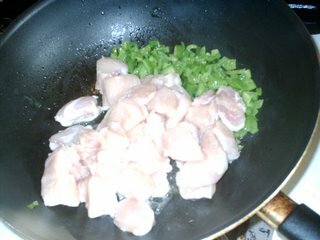 add olive oil to wok or skillet and heat then add the bell pepper and onion to saute until just turning soft. 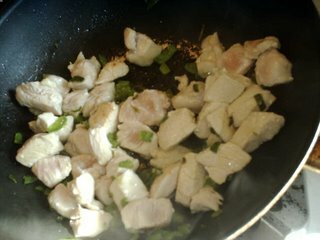 Add the chicken and cook all together until chicken is thoroughly cooked. You can add the pepper and onion after the chicken is cooked if you want and I will often do that, too. I just like the flavor of the veggies on the chicken at the beginning. Drain the pineapple, reserving the juice. Set pineapple aside. Add a bit of water to the juice just to bring it up to one cup of liquid total. Pour into mixing bowl and add 1/3 cup water, vinegar, soy sauce, brown sugar and cornstarch and stir it until it is smooth. Once the chicken is fully cooked I pour this liquid mixture and the drained pineapple into the skillet with the chicken and cook until the liquid is thickened and let it simmer for a few minutes more. We eat this over rice, couscous, millet or quinoa. You can substitute other meats for the chicken, such as cubed or chopped pork pieces or small meatballs. Be creative with it and find what you like best. This recipe feeds about 6 people. 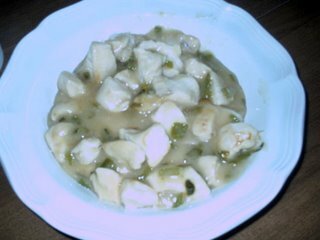 I will often make a double batch for leftovers for lunch the next day. It is great leftover, too.